Homewood Suites Anaheim Main Gate welcomes college basketball fans to the Western Regional Men’s Basketball Tournament at the Honda Center this March 24th- 26th. Homewood Suites Anaheim Main Gate is offering a special rewards promotion for guests who stay at the hotel for the men's college basketball tournament. Homewood Suites Anaheim Main Gate is offering a special promotion to all Hilton HHonors® members staying at the hotel for the event. Guests may bring in their 2016 March Madness Bracket form and receive 2,000 Hilton HHonors® Points at check-in. For more information about Hilton HHonors®, please visit http://www.hhonors.hilton.com. 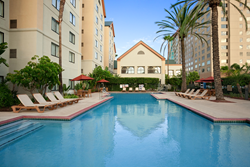 Less than a mile from the Happiest Place on Earth and a short ten-minute drive to the Honda Center, Homewood Suites by Hilton Anaheim Main Gate is perfect for families, extended-stay vacationers and everyone in between. With amazing amenities, comfortable suites and much more, the Homewood Suites works to ensure guest satisfaction in all areas. Guest amenities include: full kitchen in all guest suites, complimentary hot full breakfast daily, evening social Monday through Thursday nights, business center, free Wi-Fi, Disney Shuttle service and more. Guest favorite Welcome Home® reception, Monday through Thursday nights, is complimentary and offers a variety of light appetizers and drinks. Guests may relax in this all-suite hotel, with king or dual queen suites, as well as, accessible rooms available upon request.